Imagine over thousands of vehicles a day competing for 250 parking spaces in Zion Canyon. Since millions of cars, trucks and recreational vehicles visit Zion each year, there had to be a way to reduce the impact on the park. Our parks are threatened by air pollution. The last thing anyone wants is pollution in this spectacular park. The NPS estimates that the use of the shuttle from mid-March until late October, each year, eliminates over 40,000 vehicle trips into Zion Canyon. Other National Parks struggle, unsuccessfully, to maintain good air quality while Zion breezes by with some of the cleanest air in the United States. According to park officials, seventy-five percent of the park's visitors will use the shuttles. There is no eating or smoking allowed on the shuttle. Drink only water when on the bus and do not bring pets. The Zion Canyon Shuttle is handicap accessible and there are racks for bikes. The main road through the park is the Zion-Mt. Carmel Highway, which can be traveled by private vehicles year-round. The Zion Canyon Shuttles are clean-running propane buses. The buses stop at nine major locations in Zion Canyon. Before the shuttles traveled from the visitor center through the canyon , it was crowded along the six-mile stretch of road. Zion was getting so popular that there was nowhere to park. Shuttles only run during the busiest months of the year, March to October then private vehicles are allowed in the canyon when shuttles are not running. Private vehicles can travel SR-9, from Zion's south entrance, out the east entrance (or visa versa) to the junction of SR-9 & US-89 year-round, 24 hours a day. See tunnel restrictions for Oversized Vehicles. In summer, the only access to the Scenic Zion Canyon Drive is via Zion's shuttle, but during the winter private vehicles can travel in the canyon. Dates the shuttle runs vary. The shuttle buses used in Zion Canyon run on propane. The free shuttle bus is a hit in the park, letting hikers begin a trail at the east end of the Kolob section and catch a ride on the shuttle to the Zion Canyon Visitor Center. The reduction in air pollution and congestion are a benefit to every visitor to Zion National Park. Travel is still allowed along the Zion-Mt. Carmel Highway, the main highway through the park. 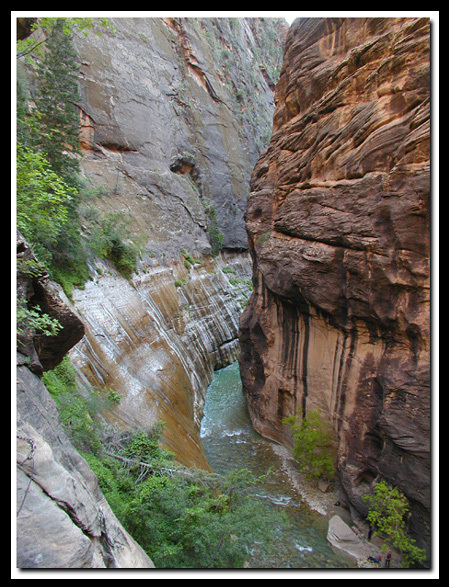 The Scenic Drive is a six-mile spur through Zion Canyon. .